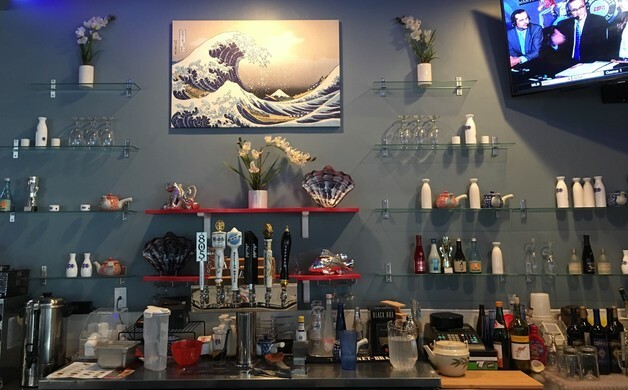 FRESNO, Calif. – If you haven’t heard, Chef Jimmy Gunara, Owner Operator of Sushi Culture in northeast Fresno, has opened a new Sushi restaurant in northwest Fresno and it is everything Sushi Culture is and more. In 2009, Jimmy and his wife Lyna decided they were going to make a go of it on their own and Jimmy opened his own Sushi establishment. 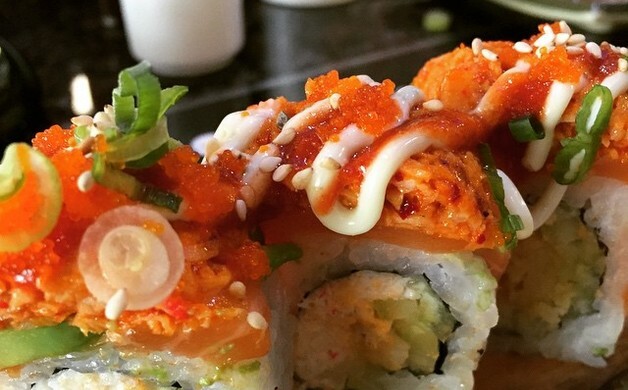 “Sushi Culture” opened to rave reviews on Shaw and Valentine. 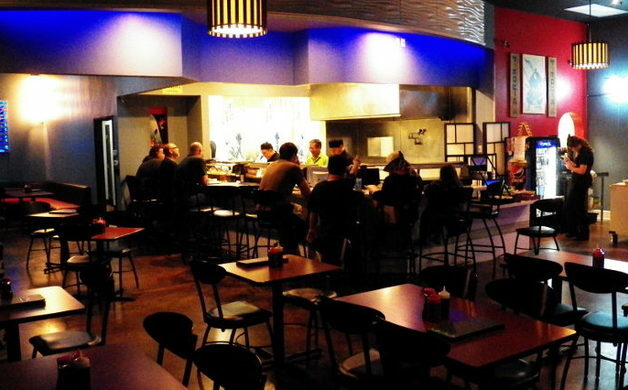 The restaurant quickly became a big hit with sushi lovers on the northwest side of Fresno. 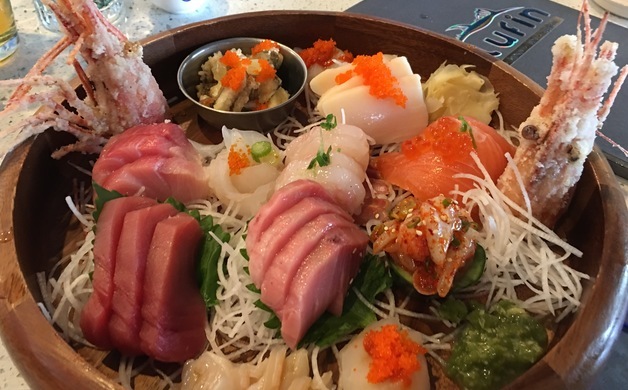 Noted for the freshness and artistry of its dishes- Sushi Cultural remains a top draw location for many sushi lovers in Fresno. Fast forward eight years and we find Jimmy opening his second restaurant at the location that was once occupied by Bella Pasta. When asked why he decided to expand to northwest Fresno, Gunara smiles and says that he only needs to drive five minutes now to work. Having a Sushi Culture “North” is a very good thing indeed. As it turns out, a number of his Sushi Culture "regulars" live on the north side of Fresno as well as in Clovis; so this second location made sense. So Gunara met with the landlords, negotiated a price and started the build out that was to become Blufin Sushi and Izakya. Blufin occupies the same retail corner where John’s Incredible Pizza and Eddies Bakery is located on the corner of Herndon and Cedar. Though Chef Gunara’s culinary sensibilities and artistry is the common denominator at both restaurants; there are notable differences between the two restaurants. One of the first things you’ll notice is that Chef Gunara’s newest restaurant is a step up in ambiance – while the décor at Sushi Culture is rather simple- some might even say sparse- Blufin's ambience is hip- with aqua bluish grey walls and the Blufin theme running throughout the décor. One thing that is the same; the Sashimi and Sushi is excellent the fish is fresh and the food is fantastic. While Sushi Culture’s menu is more traditional and straightforward- Blufin's menu is, well, out there. More adventurous. Check out some of the delectable appetizers on the menu; Toasted Garlic Salmon Skins - a delicious appetizer that has the crispy salmon skins toasted with a citrus garlic and teriyaki sauce. Avo Grille - A baked half avocado with dynamite sauce, spicy tuna topped with crunch, sesame seeds and scallions. Hamachi Kama - broiled yellowtail cheek/jaw drizzled teriyaki and Ponzu. There are also some wonderful salad specialties to note like the Mango Salsa Salmon Ceviche and the Jalapeno Hamachi Salad. All the traditional Japanese entries are accounted for- but for those who want to try something different consider the Korean inspired dishes like Galbi - bone in marinated beef short ribs, or daeji bulgogi (spicy pork). Chef Gunara has the Ramen Soup menu covered as well, offering eight different soup broths and a variety of noodles, proteins, and garnish selections. The Special Sushi Rolls at Blufin are delectable, my favorite was Lobsterlicius ; a tasty baked lobster dynamite roll with shrimp tempura, crab, avocado, cucumber, basil aioli, teriyaki sauce, sesame seeds, tobiko and scallions. 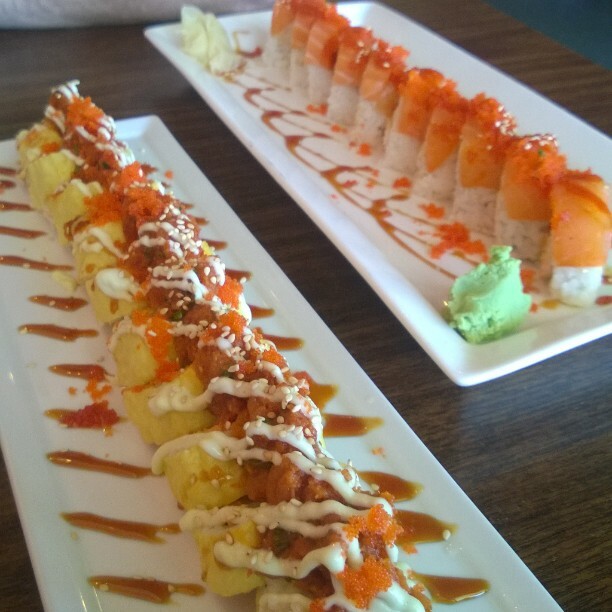 There are well over thirty variety of sushi rolls to choose from along with two Super Spicy Rolls that are made with habanero chili. 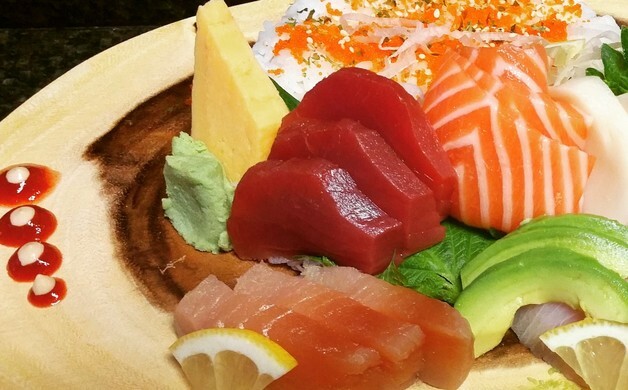 The mainstay at any Japanese restaurant is the sushi and the sashimi. 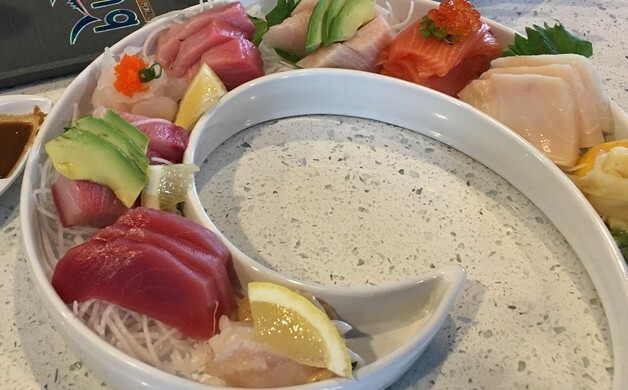 You cannot forgo freshness and like Sushi Culture, Blufin offers up some of the freshest Sushi and Sashimi dishes in Fresno. On this night, my friend and I shared an assorted mix of Ono, Yellowtail, Toro, Salmon and Unagi (Eel) all fresh. all delish. All presented with the artistic touch of one of the finest Sushi Chefs in Fresno. 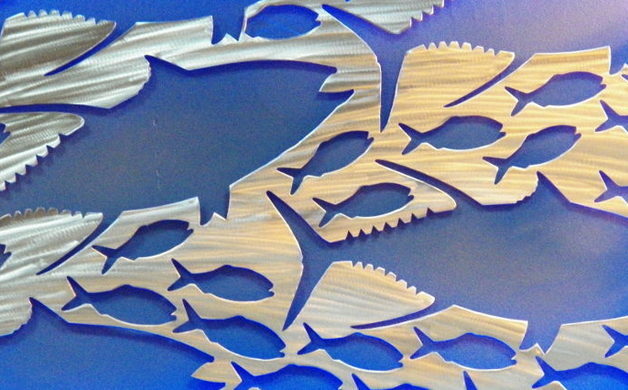 Blufin has been open now for over 8 months and the kinks of opening a new restaurant have been worked out. Service, for example, during my first visit was slow- but round two was much better. But both visits resulted in the same outcome; delicious Japanese cuisine at a reasonable price. When you are there; try to find a place at the sushi bar and engage Jimmy as to some of the dishes he is creating. 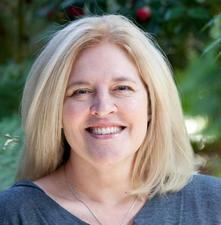 His subtle humor and the passion for the food he creates is addictive and will make for a pleasant dining experience. Chef Jimmy Gunara with guests Richard Melella and Diana Scott.